MainAll NewsDefense/SecurityWho is Major General Aviv Kochavi? Who is Major General Aviv Kochavi? A profile of the intellectual and enigmatic officer who will become the IDF's next Chief of Staff. 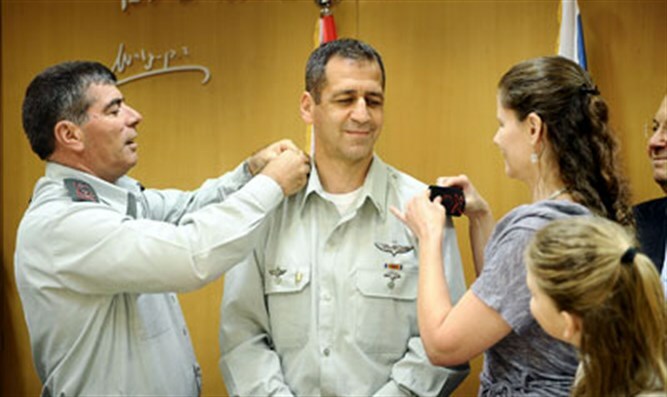 On Friday, Defense Minister Avigdor Liberman announced that he has selected Deputy Chief of Staff Maj. Gen. Aviv Kochavi to succeed Lt. Gen. Gadi Eisenkot as the next IDF Chief of Staff. Kochavi was widely expected to replace Eizenkot. Friday's announcement marks the height of Kochavi's meteoric rise from a paratrooper to a high-ranking officer considered one of the most brilliant in the military. Kochavi, 64, was born and bred in the northern Israeli city of Kiryat Bialik. Already as a child, Kochavi stood out due to his extraordinary talent. "He was mature for his age," said Etti Lostman, Kochavi's teacher at the school, "his answers did not end with yes or no." She emphasized the boy's talent for painting, which Kochavi later utilized as a tool for developing ideas and operational plans. Kochavi has served in a number of senior positions. In the past two years, he has served as deputy chief of staff, and previously served as the commander of the Gaza Division, as head of the operations division in the General Staff, as head of Military Intelligence and headed the Northern Command. In his first role as an officer, Kochavi served as a platoon commander in Battalion 890, and was later promoted to be a battalion commander, as a company commander and later as commander of the auxiliary company. In 1998, after completing his master's degree at Harvard University in the United States, he was appointed the commander of the Eastern Division of the Liaison Unit for Lebanon in 1997-1999 under the command of legendary Brigadier General Erez Gerstein. "In general, the entire period of her stay in Lebanon was very formative," Kochavi later said. "It was the first time I had been in command in almost two years in a very intense combat zone, and I dealt with all the dilemmas that exist in combat situations in general, and in fighting terrorism and guerilla in urban areas in particular. " The second intifada in 2001-2003 broke out when Kochavi served as the commander of the Paratroopers Brigade. The then-Colonel Kochavi, together with a group of other field commanders, including the Golani Brigade commander Moshe Tamir and the Nahal Brigade commander Yair Golan, who competed against him to be chief of staff, distinguished themselves for constantly urgiung the senior command to fight against Palestinian terror. During Operation Defensive Shield in 2003, Kochavi successfully led his Paratroopers Brigade to capture the Balata Refugee Camp in Shchem. On November 30, 2004, he replaced Gaza Division Commander Brig. Gen. Shmuel Zakai, and commanded the division during operations against Palestinian terror infrastructures in the Gaza Strip. Kochavi served as the commander of the Gaza Division during the period of the Gaza Disengagement expulsion, a difficult time for a commander whose division oversaw the evacuation of the Jewish settlements who they had been tasked with protecting. Shortly before he completed his term in 2006, Gilad Shalit was abducted by the Hamas terror group, leading the IDF to launch an extensive counter-terror operation titled Operation Summer Rains. Following harsh criticism that the division had information about an intention to carry out the attack, the chief of staff at the time, Dan Halutz, appointed a committee headed by Giora Eiland, but found no fault in the conduct of the plan. In 2007, he was promoted to the rank of Major General and Head of Military Intelligence, a role he served in during 2008's Operation Cast Lead and Operation Pillar of Defense in 2012. For three years, Kochavi was the commander of the Northern Command and since May 2017 he has served as deputy chief of staff and will now move to the other side of the 14th floor to the chief of staff's office.